According to the Centers for Disease Control, one out of three people over the age of 65 fall each year. Among older adults aged 65 and over, falls are the leading cause of accidental death, nonfatal injuries, and trauma-related hospitalizations. People over the age of 75 have the highest rate of non-fatal fall episodes of all age groups. 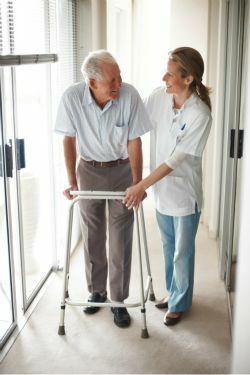 Falls are also a major reasonthat seniors find themselves no longer able to live independently. Fortunately, many falls can be prevented with the help of a Physical Therapist. Physical therapy is a health profession that strives to maximize a person’s mobility, functional ability, wellness, and quality of life. A physical therapist is a medical professional who is licensed to assess and treat impairments, functional limitations, and disabilities in patients. Many factors, both internal and external, can lead to an increased risk of falls. A physical therapist will first perform an evaluation which will include a detailed history which includes medical history, history of the current problem, patient concerns, and patient goals. The PT will then perform a physical assessment of a person’s balance, strength, sensation, proprioception (awareness of the body’s position in space), and functional mobility. The PT will also consider external factors such as the patient’s home environment, footwear, and assistive devices. Using this information, the physical therapist will develop a unique treatment program for the patient, which may include strength training, balance training, proprioceptive training, functional training, recommendation of appropriate footwear, prescription of an assistive device as appropriate, and a home safety evaluation. Strength Training: Many falls occur as the result of decreased strength. Weak muscles at the front of the leg may prevent a person from lifting their toes to help their foot clear the floor while they walk. If their toes drag, it can lead to a trip and fall. Weak quadriceps and gluteal muscles can prevent a person from standing fully erect and the added effort to stand up can lead to a fall. A physical therapist will determine which muscles are weak and develop a strengthening program that is individualized to each patient. Exercises may include squats, knee extensions, hamstring curls, and calf raises. These exercises will be performed during the PT session and as part of a home exercise program. Balance Training: Many older adults experience impaired balance for a variety of reasons including certain medications, vestibular issues such as vertigo, low blood pressure, or neurological conditions. While physical therapy may not necessarily cure the cause of the dizziness, it can help improve a patient’s balance and teach a patient to become desensitized to any exaggerated feelings of dizziness that the patient may be experiencing. Balance activities during a PT session may include standing with a narrow base of support, sitting and standing on unstable surfaces, sitting and standing activities with the eyes closed or with head movements, stepping over and around obstacles, walking on a line or balance beam, and education in alternative movement patterns. For vestibular issues such as vertigo or Meniere’s disease, there are physical therapists that specialize in vestibular rehabilitation. Proprioceptive Training: Proprioception is a person’s ability to determine his or her body’s position in space. Proprioceptive training activities are similar to balance activities and serve to stimulate the receptors in the joints that are responsible for proprioception. These include standing on unstable surfaces such as foam cushions or wobble boards, performing balance and movement activities with one’s eyes closed, and replicating joint positions with one’s eyes closed. Functional Training: Functional training with a physical therapist includes activities such as getting into and out of bed, standing from a variety of surfaces, safely sitting with control, getting into and out of a vehicle, stair and curb training, and walking in a safe and efficient manner. Many falls occur during these transitional movements, so performing them safely and in a controlled manner will help reduce the risk of falls. The physical therapist will have the patient practice these tasks in a controlled clinic environment, then generalize the skills to the patient’s home and community. Appropriate Footwear: A physical therapist will take a person’s footwear into consideration if they have a history of falls. Proper footwear is not too heavy, not excessively worn, fits correctly, can be laced or fastened easily, and offers appropriate support. Shoes that are slick on the bottom or that have heels should not be worn by someone who is at risk of falling. Assistive Devices: If necessary, a physical therapist will recommend an appropriate assistive device to help with a patient’s balance. These devices include canes, walkers, foot and ankle braces. A PT will also help train patients how to use these devices safely and correctly. Home Safety Evaluation: A physical therapist may be able to come to a patient’s home to perform a safety evaluation. This evaluation would include identifying and eliminating tripping hazards, recommending installation of grab bars if necessary, and recommending equipment such as a commode or shower chair. Unfortunately, there are some factors that a PT is unable to change. Loss of sensation from diabetes or neuropathy cannot be directly treated by a PT, but the patient can be taught compensatory strategies along with the treatment described above. A PT cannot address medication side effects, but can communicate to a patient’s physician that the prescribed medication may be contributing to the risk of falls. Incontinence can lead to falls and may be treatable by a physical therapist depending on the cause, but it is also an issue that needs a physician’s expertise. Impaired vision can also lead to an increased risk of falls, so those at risk should have their vision checked regularly and make sure that their prescription is appropriate. Many falls in older adults can be predicted and prevented. Physical therapy treatment can help remediate several risk factors for falling to ensure that our seniors are able to live longer, safer, and more active lives.